The transmission of customs and beliefs is vital to the sustainability of a culture. Cultural activist Allenby Augustin, of Haiti based cultural organization Akoustik Prod, joined us for a week-long arts residency where he engaged a number of artists of the Haitian Diaspora and kids of our afterschool youth arts engagement program at PS 189 in the mission of his organization: the preservation and promotion of Haitian traditional arts. The workshops led to our exhilarating event, Bann Konte: a Rara Storytelling Procession. On a beautiful fall afternoon, the Crown Heights community gathered to celebrate the Haitian tradition of oral storytelling, songs and games. The program began at FiveMyles Gallery with Djarara, the low rumbling of drums, and the calling of the Konè. The storytellers followed with chanting “Legba nan Bayè a”, accompanied by the musicians and a very enthusiastic crowd. A woman in a bright red dress took center stage: “Mesye, dam, la sosyete, Krik? Krak! My name is Michèle and I have come here to tell you a little story.” After Michèle Voltaire Marcelin’s wonderful tale of Who Will be King in the Republic of Port-au-Prince (spoiler: Haiti Remained without a King), the festive atmosphere of Rara was only accentuated by the demonstration of traditional games including “Wòch Mache” (walking rock) and chants of “Ewa! Ewa!” The procession then left the HCX home base, parading down Eastern Parkway in the mists of joyful dancing and invigorating melodies towards the Brooklyn Public Library. The crowd was led to the Brooklyn Public Library at Grand Army Plaza by an animated Gede-like figure dressed from head to toe in a purple outfit: Goussy Celestin, our second storyteller. She captivated us in her rendition of Mimi Barthelemy’s Ti Fou and the 7 Horn Monster. Allenby Augustin then led participants in a game of “Kash Kash Liben”, a hide and seek type of game where one person stealthily hides a rock amongst the players, while a designated player tries to figures out who has the object. The last part of the procession headed to Berg’n where Schneider Laurent, Guy Guyt and Lovely Kermonde gave an expressive and intense performance reflecting on Haiti’s political, cultural and social situation, leaving us to ponder as Djarara swayed us with their last performance of the night. Thank you to Allenby Augustin, Goussy Celestin, Schneider Laurent, Michèle Voltaire Marcelin, our funders! 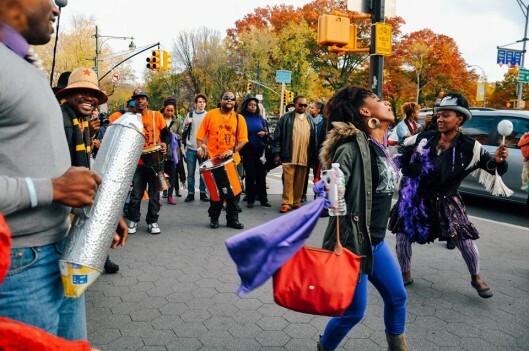 Tradition was the focus with HCX’s Bann Konte and we thank all who attended, came to support and helped take the streets of Crown Heights on Sunday, November 1st with traditional games, folktales and rara music. This entry was posted on Wednesday, November 11th, 2015 at 4:32 pm	and is filed under Archive, Arts, Dance, Events, HCX Collaborations, HCX Programs, Music, Photography, Weekend. You can follow any responses to this entry through the RSS 2.0 feed. You can leave a response, or trackback from your own site.